I have a lot of saved posts on my Bloglovin', and they're mostly recipes and places I want to eat in Leeds. I often find myself flicking through the saves for food inspiration, so I thought I would chronicle some of the best recipes I have saved on here, so you can all hopefully find some gems, and get hungry with me. These are all ones that I have tried and tested myself, I will do another post soon with the recipes which I want to try listed. First up are Amy-Liz's Lemon and Raspberry Blondies which I made the morning that Rich came back from Afghanistan, so they will always have strong memories associated with them. I can confirm that they are every bit as good as they look, and simple to make, even if you're a bit distracted. If you're after something a bit different to a regular brownie, try one of these blondies instead. I'm sure you all knew there was going to be a fair bit of The Londoner on here, Rosie is a goddess in the kitchen, and I have tried many of her recipes. 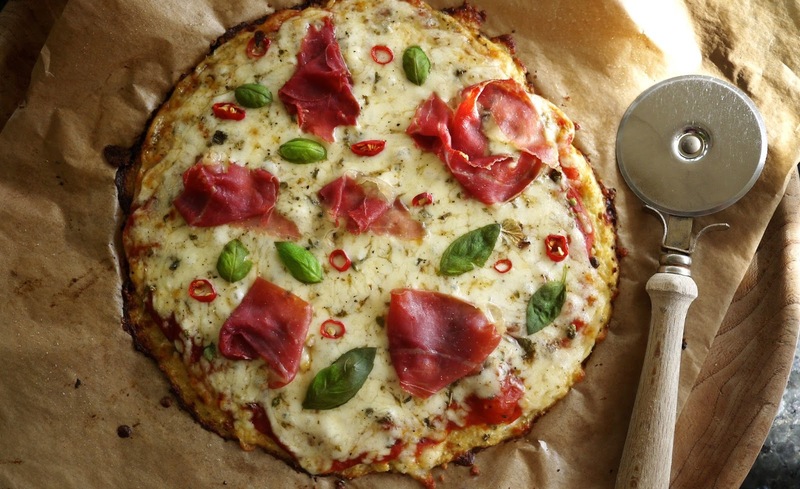 This Cauliflower Pizza recipe is one that is used on a regular basis in my house, and I have converted many a person to the ways of the cauliflower pizza. I always buy pre-grated cheeses, and just use tomato purée for the sauce and it always turns out wonderful. Be warned, this is a very filling pizza, and don't try and make the base too thin, as it just falls apart. Oh, and the basil is totally necessary. Whilst we're on the topic of The Londoner, I can't not mention Slutty Brownies can I? These are life changing, you will never look at a standard brownie the same way again. The recipe is a touch out of date now, as the packet mixes for cookies and brownies need different added ingredients, but the principle is the same. Cookie, oreo, brownie. Heavenly. For the #LeedsMayMeet we were all invited to bake something and bring it with us, and the amazing Big Fashionista brought this Malteser Tiffin with her. It vanished remarkably quickly, and after much clamouring she posted the recipe on her blog. You will have a chocolate coma if you make this, but it is really worth it. I made a slight variation on this Slice of Slim recipe for Mushroom, Spinach, Pesto and Chilli Pasta for my tea on Saturday night and it was really good. I didn't have any pesto in, so I just used 100g of extra light cream cheese instead. It was a really good naughty-feeling-but-not-really tea, and just perfect to satisfy my pasta cravings. To finish off with, The Londoner's Courgetti recipe is another one which is being eaten on an almost weekly basis at the moment. I don't have a spiralizer, so to make the courgette spaghetti I just use my box cheese grater on it's side. As long as you use long strokes, it makes perfectly yummy courgetti on the cheap. It is such a healthy meal, but really filling and tasty too. My top tip is not to forget the cheese, regular cheddar is better than parmesan in my opinion, but it really finishes the dish off. So there are my top blogger recipes I have tried and tested myself. There will be another post soon with the rest of the recipes I want to try on it, but even these will barely scratch the surface of my foodie goldmine in my Bloglovin' saves. Please let me know in the comments if there are any other recipes I must try, even if they're your own, I'm all for a bit of self promotion!